The raspberries are fantastic this year: Chanel red, glossy and juicy, and I’ll swear they are twice the size they were last year. I’m relieved because in the mini-drought during April, I didn’t water them concentrating instead on spot-watering the seedlings and plants I know to be thirsty like the early lettuces. So I did wonder if I might get some rather wizened little fruits (and maybe I would have done if it hadn’t started raining in earnest this month). So we are having a bumper harvest and may even get to store some in the freezer. 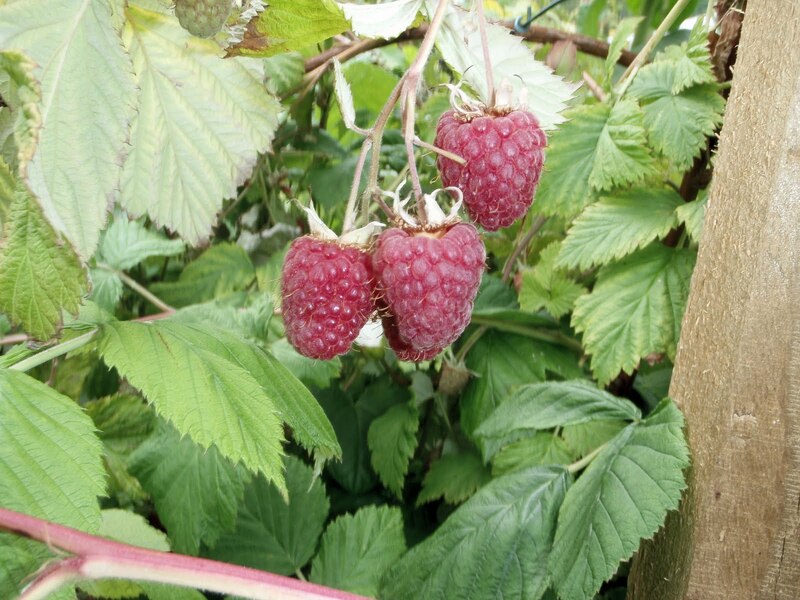 Usually they get eaten en passant – I leave a bowl of raspberries out in the kitchen and they’ll be gone within a couple of hours. However, confined to the house by a particularly squally rain shower and thinking that the current batch of raspberries might need eating up really quite soon, I thought a spot of baking might be appropriate. These are raspberry muffins, adapted from Nigella’s Blueberry Muffin recipe (How To Be A Domestic Goddess), which can also be found here, by substituting 200g raspberries for the blueberries and adding half a teaspoonful of vanilla extract. Mix together the dry ingredients. Beat together butter, egg and buttermilk in a separate bowl. Pour the wet ingredients into the dry ingredients and mix lightly with a wooden spoon – a few lumps don’t matter. Fold in the raspberries and vanilla extract. Scoop (N’s suggestion of an ice-cream scoop turns out to be just the thing) into muffin cases and bake in a suitable tin for 20 minutes.